Can you tell I’m a huge fan of crumbs? I can’t help it. I just want to add crumbs to all my muffins, bread and cakes! I’m finally starting my holiday baking. So for my first baking recipe, I thought I’d kick it off with something eggnog and something Kahlua! Yes, it’s a FANTASTIC combination if you haven’t tried it already. 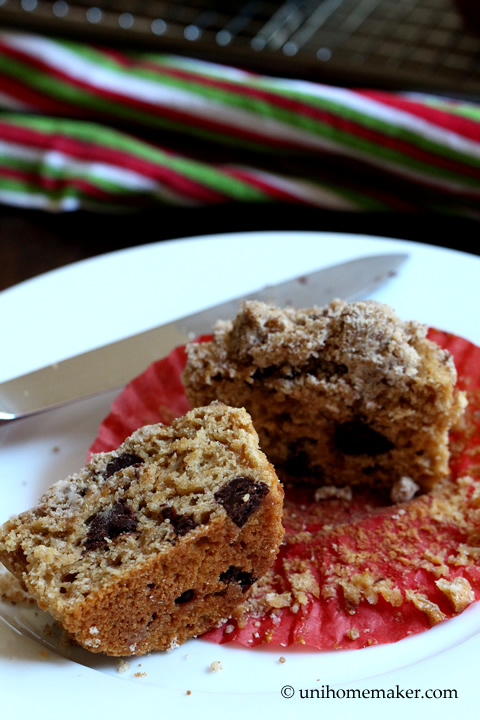 This is definitely a muffin you’ll want to have coffee with. It’s like peas and carrots, they go hand-in-hand. And a little dark chocolate can never hurt in a combination like this. Just before dinner, we snacked on a few of these. They were so good that dessert came before dinner. You’ll know what I mean when you bake these. Eggnog. Kahlua. Chocolate. Crumb. Enough said. Now go bake some. Have a great weekend! Preheat the oven to 350 degrees F. Line baking cups in the muffin pan (I lined a 12-cup and a 6-cup muffin pan). Using a stand or electric mixer (or mix by hand) cream butter and sugars (granulated and muscovado) until fluffy. Beat in egg, Kahlua and eggnog. Mix until combined. In a medium bowl whisk together flour, baking powder, ground cinnamon, nutmeg and salt. Slowly add the flour mixture into the eggnog mixture and mix until just moistened. Fold in chocolate chunks. Spoon batter into the lined muffin cups, about 2/3 full (I used a 3-tablespoons large cookie scoop). For the crumb topping: Mix flour, muscovado sugar, ground cinnamon, salt, Kahlua and butter in a medium bowl with your fingertips until it looks like wet sand. Sprinkle generously over each baking cup and bake for 20-22 minutes or until toothpick/tester inserted into the center comes out clean. Cool slightly in the pan before transferring them to the cooling rack. Kahlua and eggnog! 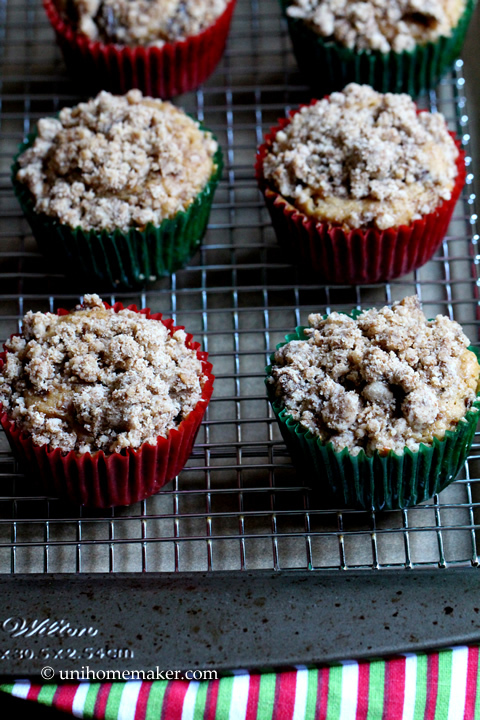 Love them both and amazing combination in these muffins! I love a good crumb topping. And chocolate. And muffins. Really, there’s nothing I wouldn’t like about this recipe! Good stuff – thanks. really great looking muffins! great shape and look moist enough on the inside! Oh Anne – these look divine! Crumb topping is not my strongest baking skill, but you remind me I must practice (just an excuse for more baking!) – I absolutely love a good crumb! 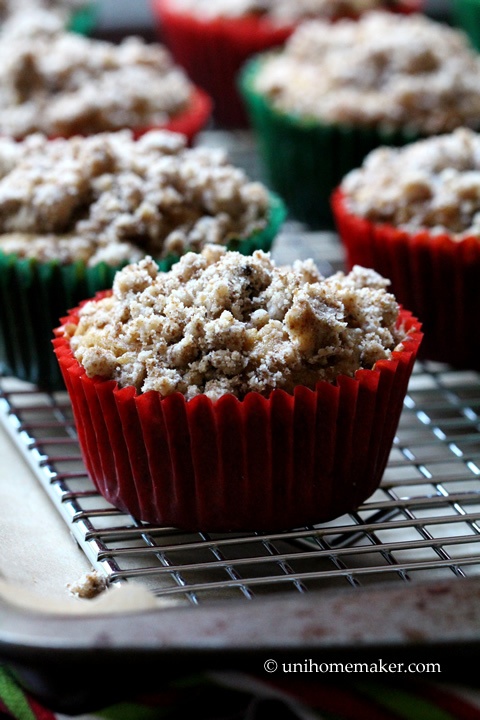 These muffins are calling out my name! Great post. 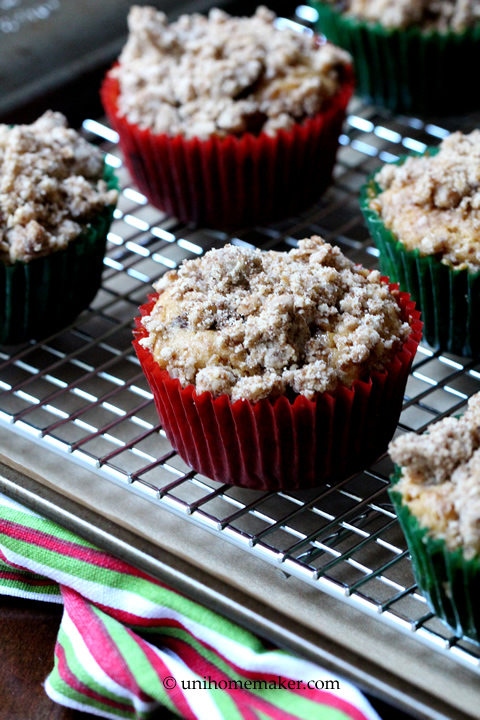 Eggnog, Kahlua and crumbs all in one lovely muffin…you are great! Oh wow kahlua and eggnog!!! Amazing combination. I have to try it. And I really like crumb coats too :). This muffin is perfect. I’m obsessed with crumbs! I knew there was a reason why I liked you. 😉 Then add eggnog, coffee AND chocolate?! Heaven in a muffin tin I tell you. 🙂 Awesome job and gorgeous pics as always. Pinning to make! I’m in love with all these flavors together Anne! And crumbs too! I could just eat a big pan of them. 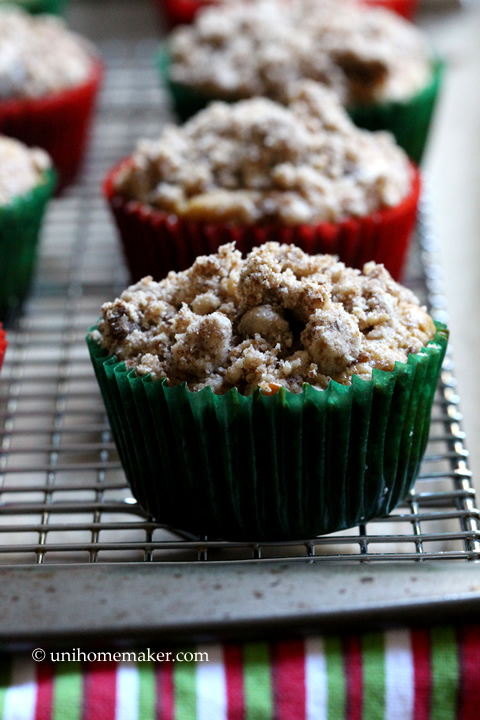 But I wouldn’t want to miss out on these amazing muffins! They’re stunning. Just had to come back and say thanks for sharing these at Marvelous Monday this week… pinning to my MM board! Oh wow, these sound SO amazing – I absolutely could go for one (or more!) right now. Thanks for sharing!